Details The mineral lazurite is a complex sodium calcium aluminum silicate sulfate, in which the part of the silicon atoms (SI) are substituted for sulfur atoms (S) in the form of sulfur anions. The rich blue color is due to the sulfur inherent in the structure of lazurite. It is usually described as an intense blue to a gray blue. 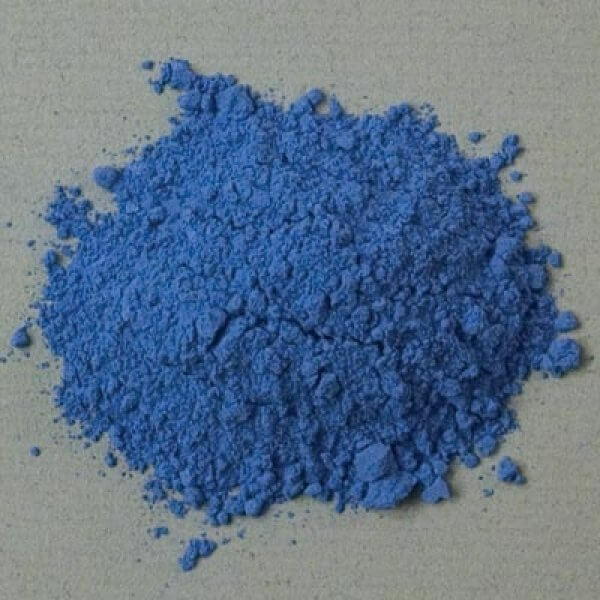 The greater the sulfur anions, the more intense is the blue color of lazurite. 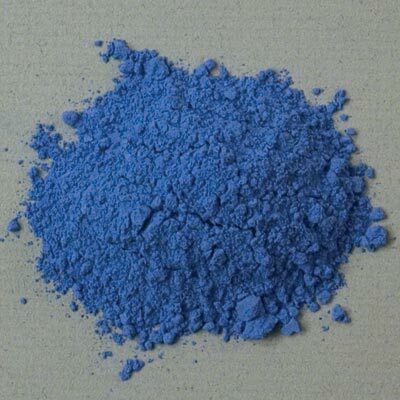 In its vivid dark blue variety the content of sulfur reaches 0.7%. 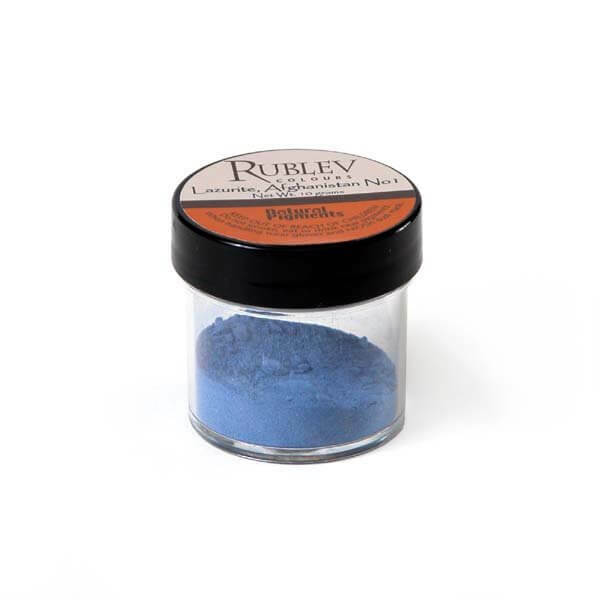 Lazurite, an amply soft and brittle mineral, is easily processed as a pigment. It is a popular but expensive mineral commonly found combined with other minerals in a rock called lapis lazuli. Lapis lazuli or lapis for short is mostly lazurite but commonly contains pyrite, calcite and other minerals. The name lazurite means "blue rock" and is always a brilliant blue with violet or greenish tints. Small crystals of pyrite (FeS2) are always present in lapis and their gold yellow color distinguishes lapis from a similar mineral, sodalite, and the synthetic pigment, ultramarine. The golden impregnations of pyrite create the impression of stars in a dark blue sky. Calcite produces white streaks in lapis and too much calcite lowers the value of the mineral pigment. The carbonate mineral azurite has a very similar color to lazurite but is associated with the green mineral malachite. Lazurite is a historical pigment having been found in Egyptian tomb paintings as early as the Fourth Dynasty (sixth century B.C.). The statue of pharaoh Tutmos III was covered with lazurite, known to the ancient Egyptians as the "sky stone." Raphael, Leonardo da Vinci and Michelangelo Buonarotti used the pigment. The two large (five meters high) central columns of the iconostasis of Isaacs Cathedral in St. Petersburg were made in 1854 from Badakhshan lazurite, purchased by Russian empress Ekaterina II at the price of a pound of silver for a pound of stone. Lapis lazuli has been mined for centuries from a location still in use today in the mountain valley of Kokcha, Afghanistan. First mined 6,000 years ago, the rock was transported to Egypt and later to Europe where it was used in jewelry and paint pigment. Europeans called the expensive powdered pigment ultramarine, which literally means over the sea. Since the 19th century, ultramarine has been manufactured artificially. Although now not the only source of lazurite, the mine in Afghanistan still produces the finest quality material. Lazurite is found only at high altitude, especially in deposits of tall mountain ranges. For example, in 1931, it was found in the Pamirs Mountains at the height of 5,000 meters. In these mines enormous chunks of dolomite marble hold fast to small accumulations of lazurite. To protect mines from looting, in past centuries an unauthorized approach was penalized by capital punishment, and miners themselves were secured to the walls of mine shafts by chains. Lazurite was considered to be a sacred stone, and the right to manage its production was held by the emir himself. In Russia during the 18th and 19th centuries, lazurite was very highly valued for many objects of applied arts. A new epoch in the use of a lazurite began with the discovery in 1851 of a large deposit near Lake Baikal, after which Russian workshops achieved a high degree of craftsmanship in the manufacture of large art objects (columns, vases, etc.). Lazurite is currently extracted from two regions of the former Soviet Union: Malobystrinskoye deposit of the south Baikal region, and the Lyadzhvardarinskoye deposit in the southwestern Pamirs Mountains. The first layer is processed as an open pit, and the second through underground mining galleries. Lazurite from these deposits provide faultless specimens for jewelry, and the remaining accumulations, which are unevenly distributed in dolomite marble, are used for the production of mosaics and high quality paint pigment. Other significant deposits of lazurite are found at Ovalle, Cordillera, Chile; Mt. Vesuvius, Italy; Cascade Canyon, San Bernardino Mountains and Ontario Peak, California and in the Sawatch Mountains, Colorado, U.S.A.
We buy select pieces of lapis lazuli stone from one of the oldest lazurite mines in the world in Afghanistan. For more than 4,000 years, lazurite has been extracted at Shar Shakh in Badakhshan, Afghanistan, where we obtain our mineral. Lazurite is resistant to atmospheric gases, is lightfast and possesses good hiding power. It is durable with all other permanent pigments. It is suitable for all techniques. Lazurite absorbs a moderate amount of oil during dispersion and forms a good flexible film. To prepare pigment from lazurite, selected pieces of small size, as free as possible from pyrites and other impurities, are heated in a crucible and quenched (étonné). This material is then finely ground, levigated and washed. Cennini describes a method to purify the pigment even further to obtain the highest quality grades of pigment. Basically, finely washed pigment is mixed together with a little wax, rosin and linseed oil in the form of a dough. This is kneaded in a weak solution of soda lye. The finest particles of color are withdrawn by the alkaline water and settle out when left standing. The dough retains the impurities. This process is repeated and the consecutive extracts from the same dough become grayer in color. The first extraction is the purest and deepest blue color, the last extraction, blue gray in color. We will soon offer grades of lazurite hand processed with this ancient formula. Lazurite is not considered toxic but care should be used in handling the dry powder pigment so as not to inhale the dust.